Jean-Paul Belmondo, the french actor, was born on 9 April 1933 in Neuilly-sur-Seine, Hauts-de-Seine, west of Paris. He did not perform well in school, but developed a passion for boxing and football. He made his amateur boxing debut on 10 May 1949 in Paris, France, when he knocked out Rene DesMarais in one round. Belmondo’s boxing career was undefeated, but brief. He won three straight first round knockout victories from 1949 to 1950. His breakthrough role was in Jean-Luc Godard‘s À bout de souffle (Breathless)1960, which made him a major figure in the French New Wave (French: La Nouvelle Vague). Later he acted in Jean-Pierre Melville’s philosophical movie Leon Morin, Prêtre (1961) and in Melville’s film noir gangster film Le Doulos, 1963 and Godard again with Pierrot le fou (1965). With That Man From Rio (1965) he switched to commercial, mainstream productions, mainly comedies and action films but did appear in the title role of Alain Resnais’ masterpiece Stravinsky (1974), which some critics regard as Belmondo’s finest performance. 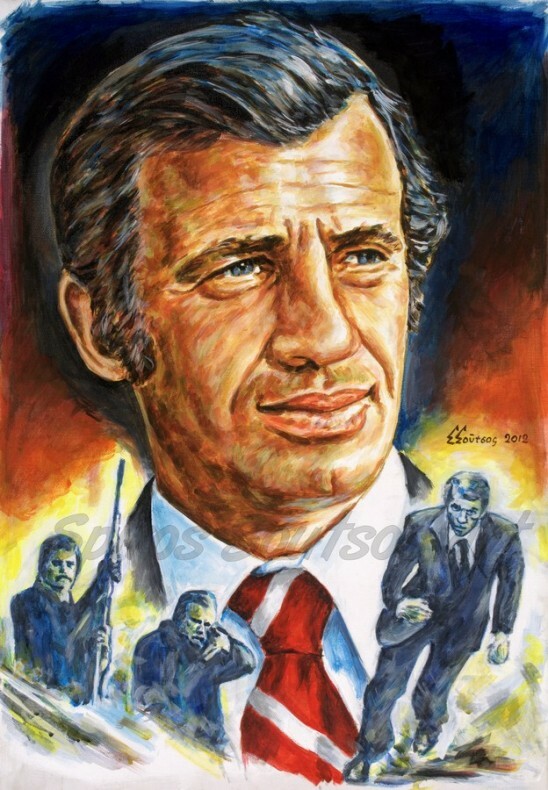 Until the mid-1980s, Belmondo starred in many successful film-noir and action movies as François Truffaut’s, La Sirène du Mississippi (1969) wth Catherine Deneuve, Jacques Deray’s Borsalino (1970) with Alain Delon, Henri Verneuil’s Le Casse (1971) and Le Corps De Mon Ennemi (1976), Philippe Labro’s L’Héritier (1973) and Georges Lautner’s Le Professionnel (1981) with Robert Hossein. As he grew older, Belmondo preferred concentrating on his stage work, where he encountered success. He suffered a stroke in 2001 and had since been absent from the stage and the screen until 2009 when he appeared in Un homme et son chien (A man and his dog).